Horses have an amazing ability to capture the eye and heart of many humans.Not only their beauty, grace and amazing speed attract, but also the natural connection on a deeper spiritual level brings horses and humans together. When a horse and rider are attuned to each other we often hear “they move as one”. This ability to communicate on a mystical or psychic level is what can be of great value to those who are in need of healing. Special horses have long been regarded as “medicine horses” by the Native Americans. The warriors and Shamans saw and experienced what horses could do to save and protect their human partners. 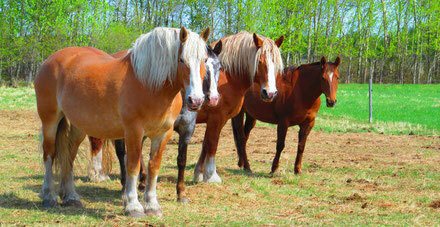 Today horses form the basis of healing therapies in many parts of Canada and around the world. The horses ‘prey animal’ nature makes it wary of humans as predators; that they eventually trust us and even want to help us is an override of the genetic patterns that tell the horse to “RUN”, escape from the “meat eater”. 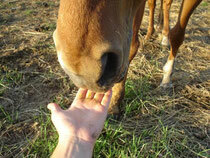 There are many documented cases where horses have reached out to the bereaved, the abused and the terrified. Horses have given these people peace and helped them ground themselves to allow the sadness, shame and fear to be released. Horses can mirror what is going on in the human mind, whatever energy is moving there will also move the horse. That is how the horse can assist in healing and human wellness at Winning Ways. Kelly has experience with at-risk-youth through a series of riding lessons taught to some young boys who were “difficult” at school and as well, she worked with Downs Syndrome children in riding lessons over several years. Her experience with the international volunteers, who have been atWinning Waysover the past decade, has given her the opportunity to learn many techniques for helping humans in transition and guiding them to more insight about the way they think and behave. Watching animals (dogs, horses, cows and cats) reaction to each individual human gives a non-judgemental assessment of the person. Interaction with animals can teach many life skills and promote strong character building. Horses are highly sensitive and as such can intuit the human's emotions and underlying needs, it has been said that you can fool some of the people, some of the time but you can't fool a horse. This is especially true of the "brave" and "I know all about that" personae. A horse will soon determine if you are knowledgeable and brave or just “bluffing”.